This past January we went up to Tahoe. Seeing as I'm not a winter sports guy I don't go to Tahoe very often. Maggie hadn't ever been and a bunch of friends were renting a house in Tahoma so we joined the party. We got really lucky that the biggest storm in years just happened to dump hella snow a couple days before we got there and then the weather was gorgeous the entire time we were up there. On our way up, we stopped at Fifty-Fifty Brewing in Northstar Village for lunch and some delicious crisp beers. Their beers reminded me a lot of Maine Beer Company due to the crisp and bright flavors. I'm guessing they have a great water supply either a spring or snow melt. You can really taste the difference between breweries that use fresh water and those that are stuck with municipal supplies. We each got a flight of 5 beers. Maggie stayed on the lighter side ranging from a golden ale to pale ales while I started hoppy and ended dark and brooding with 3 IPAs, a porter, and a stout aged in a Cognac Barrel. I was a little apprehensive about ordering a barrel aged stout because the last few ones that I had tasted more than root beer than stout. The waiter talked me into it because apparently the brewery is known for their barrel aged stouts. Maggie loved all of her choices and there wasn't much sharing. I found the ale brewed with lemongrass to be interesting but much more of a summer beer than an its 30 degrees outside and I need something to warm me up sort of beer. The session IPA reminded me of Sculpin's Mango Even Keel so much it was uncanny. The Rye IPA was delicious. The porter was one of the best porters I've had in a long time with lots of vanilla and coffee notes. The stout was by far the best barrel aged beer I've ever had. Maybe its the Cognac barrel instead of the usual bourbon or maybe they have a superior technique. I'm not sure but either way its damn good. The Cognac isn't over powering it still tastes like a stout but with subtle notes that seemed just outside of my grasp. The only bad part of the experience was the pulled pork in our nachos was a little too sweet and we probably should have gone with the chicken because everything else in the nachos was just what we needed. When we got to the cabin the power was out. This was back in January when the big storms were rolling through California. In order to help warm us up we had an impromptu whiskey tasting. I brought Hudson Manhattan Rye Whiskey and my friends brought 4 Roses small batch bourbon, Templeton Rye, and Basil Hayden. The Hudson was my favorite. It was more smooth than the rest and the flavors are on point. The Basil Hayden and 4 Roses were also very good. The Templeton Rye was too harsh for me. I can't tell you too much about the night but there was a glow in the dark puzzle and lots of beers involved. On our way back home to the Bay we stopped at Kingvale to do some sledding. It cost $10 to park and then $10 each to sled. I always think of sledding as being just for kids and it looks kind of blah but in reality it's terrifying! I have no problem riding down a hill at 40mph on a bike but a sled just goes where it wants to go and any attempt to lean or steer results in an uncontrolled spin. Actually, sledding made me realize that its for kids because they heal faster and their spines are made of elastic. There was a short slope with lane dividers and a longer one without. As you may know its nearly impossible to steer a sled so the open one added extra adrenaline because at any moment my 230lbs could plow into some kid. Good thing we all signed waivers before we were allowed on the slopes. The two lower slopes were pretty busy so we wandered up the hill and found 3rd slope with divided lanes that we had pretty much to ourselves and a hispanic family a few lanes over. We didn't get injured and we had a blast. We were famished after sledding so we stopped for burgers in Auburn at the Auburn Ale House. I have been through the upper portion of Auburn with all of its fast food joints numerous times but I didn't know there was a quaint little old town. The Ale House had the best burger I've had in a long, long time. It was cooked to perfection (medium rare) with just the right amount of juiciness and bacon. We both had burgers. I went with a stout on nitro and she had a golden ale we both enjoyed our beers but we were pretty much over drinking by the end of the weekend. Since it is in the heart of gold country all of the beers are named after the gold rush. Tonight I had a refreshing, crisp Extra Pale Ale from Knee Deep Brewing Company in Lincoln, CA in the Sierra Foothills. Its a single hop ale meaning they only used one varietal of hops in this case Citra which has been surging in popularity in recent years. As you would imagine from the name, Citra hops yield more citrus flavors such as grapefruit and lime than other hops. At 7% alc/vol it is a little stronger than the average pale ale which I guess is where the "extra" in the label comes from. The "extra" could also be because this is a lot hoppier (45 IBU) than most pale ales. As you can see in the picture below it is definitely not an "extra-pale" ale as the color is about average for a pale ale. 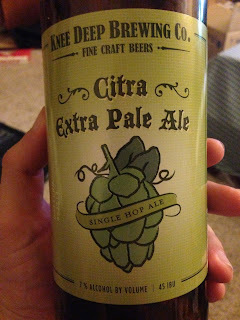 At $6.99 for a 22oz at Whole Foods (you can probably find it cheaper elsewhere) its a special occasion beer and to be honest there are better beers at this price point or lower, but if you really want to know what Citra hops taste like this a great specimen. Its a great beer, but the price takes it out of being highly recommended. When you are enjoying the holidays with your friends and family try pairing these wonderful local wines with your meals. Point Reyes Vineyard's non-vintage blanc de blanc ($29) is grown sustainably just north of Point Reyes Station along highway 1. It is a wonderful sparkling wine with citrus, pear and a slight yeastiness on the nose. Upon the palate the citrus refines itself into lemon, the yeast becomes baked bread and there is a floral note reminiscent of orange blossoms. This is tart and crisp and would pair wonderfully with shellfish. Pey-Marin's 2009 "Trois Filles" pinot noir ($39) is grown at several vineyards in West Marin with the majority hailing from the dry farmed and organically grown, Corda Vineyard. The wine was aged for 14 months on French oak barrels with 25% new oak. The long extraction period with a moderate percentage of new barrels balances the aromas of the fruit and the bouquet from the oak. The wine is a dark garnet color. On the nose there are layers of earth and spice with notes of sour cherry, raspberry, cinnamon, clove, and forest floor. On my tongue I tasted rich earthiness, bright cherry, raspberry, and cloves as well as some dark fruits and slight fresh leather notes. This is an old world style pinot that is more bouquet driven than fruit forward with a soft front to mid palate mouthfeel and bright acidity. This pinot noir will pair nicely with turkey. Pacheco Ranch Winery's 2005 cabernet sauvignon ($25) is grown in Novato on an East facing hillside along highway 101. The nose is earthy with notes of eucalyptus and bell pepper. The earthiness carried through to the palate where I noticed dark cherry, cranberry, cloves, and rich tobacco. The tannins yield a gravely, astringent mouthfeel. The bold tannins will enable it to pair nicely with beef as tannins bind with the meat's proteins in your mouth making the meat more tender and juicy. This wine would also be great for making mulled wine. Mulled wine reminds me of visiting my dad in Berlin and going to the Christmas markets where it is called glühwein. It is pretty easy to make, all you need is a decent bold red wine, a pot to heat it up in, spices, 1/3 cup of brown sugar, 1/4 cup of brandy and an orange or a lemon, peeled and sliced (keep the peels for adding zest). The spices vary on individual tastes and traditions, but they all have cloves and cinnamon sticks at the center with other spices including ginger, allspice, cardamon, peppercorns, vanilla beans, and nutmeg. You put all of the ingredients into a pot and heat them up together for 30-60 minutes making sure not to let it boil. Play with the proportions to taste. Strain the mulled wine into mugs and serve warm to hot. For dessert I recommend Charbay's pomegranate dessert wine ($45) made with 100% organic, tree-ripened pomegranates from the Central Valley. It exhibits intense pomegranate flavors with a slight minerality. The wine is sweet but not too sweet and is great when served chilled. I find fresh orange peel makes it even more festive or a splash of orange bitters will give it a bit of a kick. It goes great with roasted chestnuts or chocolate. Point Reyes Vineyards is located at 12700 Hwy 1 in Point Reyes Station and is open for drop-ins Saturday and Sunday from 12:00pm to 5:00pm. For more information, call (415) 663-1011 or visit ptreyesvineyardinn.com/winery.htm. Pey-Marin can be found at Insalata's, Il Fornaio, Marin Beverage, Whole Foods, Mill Valley Market, Ludwigs, and many other fine wine shops throughout Marin. 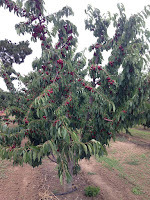 For more information on Pey-Marin, call 455-9463 or visit scenicrootwinegrowers.com. Pacheco Ranch Winery is located at 235 Alameda Del Prado Road in Novato, Ca 94949. For appointments call 883-5583. For more information visit pachecoranchwinery.com. Charbay is available at The Buckeye Restaurant, Mill Valley Market, Rick's Wine Cellar, and other establishments throughout Marin. 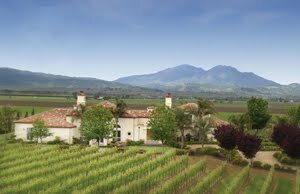 The tasting room is located at 4001 Spring Mountain Rd in St. Helena, California.. For more information, call (707) 963-9327 or visit charbay.com.